Storey Publishing, LLC, 9781612128559, 144pp. Following the best-selling Cooking Class, this delightful baking companion for kids ages 8–12 features 50 easy-to-follow recipes. Lively step-by-step photos teach bakers-in-training how to knead dough, make biscuits, decorate cookies, and produce a perfect pie, along with essential skills like following directions and accurately measuring ingredients. They’ll learn to make both sweet and savory treats and will use fresh fruits and vegetables in recipes such as Bursting with Blueberries Muffins, Zombie Zucchini Bread, and Peachy Keen Crumble. Bonus goodie bag stickers, pop-out gift tags, and bake sale signs encourage kids to share their homemade delights with pride. 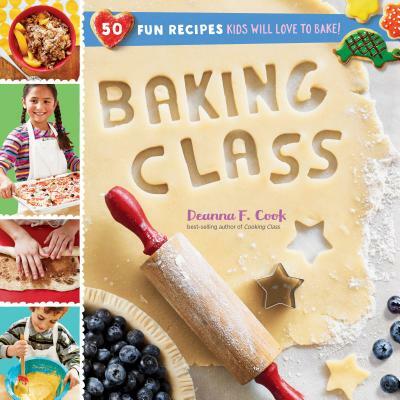 Deanna F. Cook has written award-winning books for kids, including the best-selling Cooking Class and Baking Class, as well as Farmers Market Create-and-Play Activity Book. She has been the creative development director at FamilyFun and has worked as an editor at Scholastic, Disney, and Kidstir.com. She lives in western Massachusetts and can be found online at deannafcook.com.